WHAT PRICE IS YOUR FREEDOM WORTH? 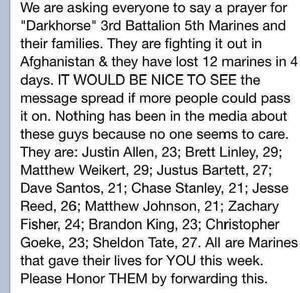 That question has been asked to many family members who have lost a loved one in the protection of our Country. The cost is insurmountable!!! This year our SERC President, Pinky Barbour has focused her HOPE FOR HEROES project on the Folds of Honor Foundation. By providing financial assistance for the education of spouses and dependent children; this Foundation honors the Sacrifice of our service men/women who have fallen or are permanently disabled while serving and defending our great Nation. How can you HELP? At SERC in October our keynote speaker will be a representative of the Folds of Honor Foundation. President Pinky would like to present the representative with a check showing our gratitude for those who have sacrificed so much for you and for me. The American Flag is the symbol of our great nation. The 50 stars of the flag represent the fifty states of the United States of America. The 13 stripes stand for the 13 original colonies established by our ancestors over 200 years ago. The colors of the flag stand for our national ideals. The red is for valor and sacrifice. The white is for innocence, and purity. The blue is for perseverance and justice. Hoist: The height of the flag along the edge that connects to the flag pole. Fly: The length of the flag along the top edge. Fly End: The end of the flag that’s not connected to the flag pole. Canton: The upper left hand corner of the flag (the blue area with stars). Field or Ground: The face area of the flag. Also defined as the background color or pattern of the flag (the red and white stripes). 1. The American flag should never be allowed to touch the ground or floor. 2. The American flag should never be stepped on. 3. A flag should never be used as “clothing apparel, bedding, or drapery”. Decorative flags may be used as decoration for coffins during funerals. 4. The flag should never be bunched up in any way. 5. The flag should never be used as a ceiling for a shelter. 7. The flag should never have any mark, insignia, letter, word, number, figure, or drawing of any kind placed on it or attached to it. 9. In a parade, the flag should not be draped over the hood, top, sides, or back of a vehicle, train, or boat. When the flag is flown on a car or truck, the staff should be fixed firmly to the chassis or clamped to the right fender. 10. When the flag is lowered, no part of it should touch the ground or any other object. It should be received by waiting hands and arms. 11. The flag should be cleaned and mended when necessary. 12. The flag should never be flown in inclement weather unless an all-weather flag is used. 13. When a flag is so tattered that it no longer fits to serve as a symbol of the United States, it should be destroyed in a dignified manner by ceremonial burning. The Veterans of Foreign Wars, The American Legion, The Boy Scouts of America, all branches of the military, and other organizations regularly conduct dignified flag-burning ceremonies. Bring old flags to these organizations to be properly dispatched. 14. 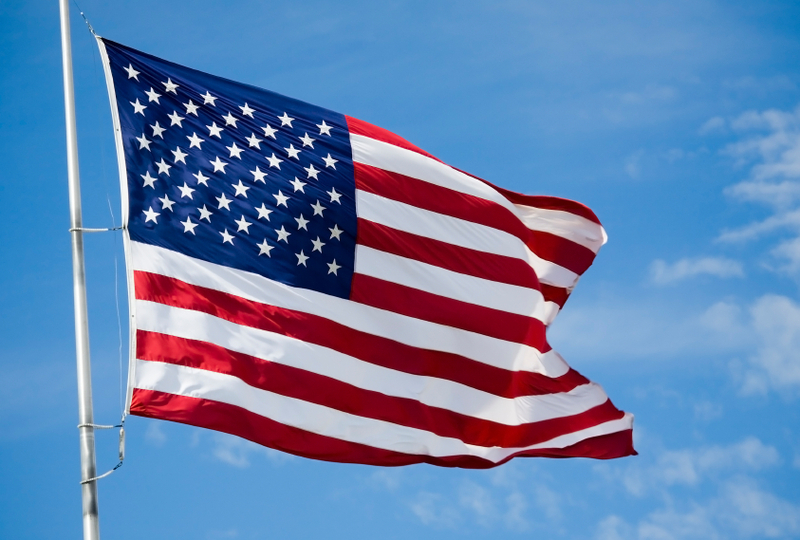 Wherever the American flag is hung or flown, it must be able to hang freely without touching anything beneath it. 16. To store the American flag, it must be folded properly and ceremoniously. 1. Begin by holding the flag waist-high with another person. The field or face of the flag should be parallel to the ground. Remember to hold the flag tight throughout each step to keep it from touching the ground. 2. Fold the flag in half lengthwise so the stripes meet the stars. Now hold the flag waist-high again with the stars facing down, and the stripes facing up. 3. Fold the flag lengthwise again so the stars are on the outside. 4. Make a triangular fold on the striped end by bringing the corner up at a right angle to meet the open edge of the flag. The other person should be holding the striped end firmly in place throughout the rest of the steps. 5. Turn the outer tip of your first triangle inward, parallel to the open edge, to form a second triangle. flatten any wrinkles or creases you see before making the next fold. 6. Repeat step five until the flag is completely folded. 7. When the flag is completely folded, it should be a small triangle, with only blue and stars showing. 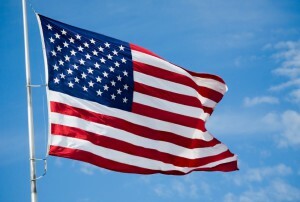 Take care of this precious symbol of our republic and fly it proudly throughout the year! Hope for Heroes - Did you Know? ESA’s support for military personnel and their families began during World War II. After the war, ESA chapters were often organized near military bases and among military families whose membership assisted them in keeping connected as they moved to new assignments around the world. Much of ESA’s early international growth was a result of military members forming new chapters as they moved to new bases. Hope for Heroes is specifically directed at providing membership support for military personnel and their families. The program recently evolved to include an annual ESA Hope for Heroes national event held each year in November, on or around Veteran’s Day. This week of celebration includes recognizing veterans, sending greetings to local military personnel who are serving abroad, and organizing additional activities to supply locally known troops with goods and materials to share with service personnel who are far from home. Activities for ESA’s Hope for Heroes continue throughout the year. Individual members and chapters often partner with other veterans’ organizations, military support groups, and military hospitals to provide a variety of materials for families, returning soldiers, and wounded warriors. All of ESA's efforts are intended to assist in meeting the needs of the individual recipients, but also to lift their spirits and feel the gratitude that ESA members feel for their service. The types of services provided by ESA vary by chapter and by the specific services that military support groups request. However, most often, ESA members send care packages to deployed troops, provide meals for homeless veterans, help families when they are away from their loved ones, stock base food banks, and much more. REMEMBER THE OLD DAYS WHEN SOME OF US USED TO CLIP MANUFACTURER’S COUPONS AS A PHILANTHROPIC PROJECT? WELL, YOU CAN STILL DO THAT THROUGH THIS PROGRAM. And, if you look on the web, there are some sources where you can do this and send the coupons DIRECT to listed U.S. military bases abroad. I know of at least one Florida chapter that sends their coupons to a base in Tokyo. program gives these hospital or wheelchair-bound vets something to do, and something to look forward to. Trading duplicates also connects them with other collectors. Leave about a 1/2 inch border of envelope around the perforations of the stamp. Do not remove the stamp from the envelope it is glued to. 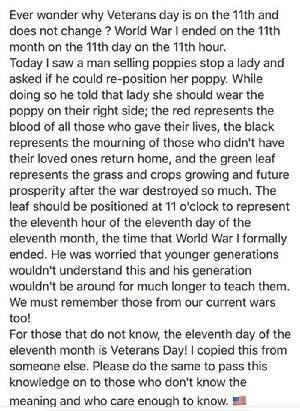 The veterans prefer to do that themselves. It’s part of their fun. Wounded program in Falls Church, VA. It was started in 1942 to support our wounded warriors. Time is not of essence in this project! Postage stamps are not date sensitive. LOOKING FOR EXPANDED REWARD IN YOUR PHILANTHROPIC PROGRAMS THIS YEAR? WHAT DO YOU KNOW ABOUT FISHER HOUSE? Today, there are 66 homes located at major military and VA medical centers nationwide, in Germany and in the United Kingdom, close to the medical center or hospital they serve. Fisher Houses have up to 21 suites, with private bedrooms and baths. Families share a common kitchen, laundry facilities, a warm dining room and an inviting living room. Fisher House Foundation ensures that there is never a lodging fee. Since inception 25 years ago, the program has saved military and veterans’ families an estimated $320 million in out of pocket costs for lodging and transportation. The Fisher House operates on donated funds. Items on the Bay Pines Fisher House wish list reflect items that are either one-time needs or on-going needs of running the house. Every donation helps make the Fisher House a home for our veteran’s families. Donations are accepted Monday through Friday 8:30 a.m. to 3:30 p.m. Please call the Fisher House Manager to make arrangements to drop off donations at 727-319-1350. Without the donations from the community the Fisher House would not be the success it is. All donations are appreciated by our families. Gift Cards allow ease in picking up items needed for the Fisher House. For the Fisher House consider Wal-Mart, Publix, Winn Dixie, Target, Kohl’s Home Depot, Lowes, Sam’s Club or general VISA or MasterCard gift cards.